My little princess has had an obsession with princess crowns ever since she came home with one from Vacation Bible School this past summer. It was one of those imported plastic ones, the silver paint started peeling a week later and we decided to toss it, who knows what kind of toxic chemicals are in that paint? She's been asking for a princess crown ever since! 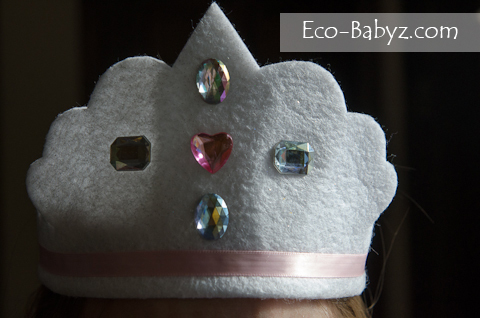 Baby E was absolutely delighted to receive the Marin Scalloped Princess Cut Felt Crown with Gemstones from the Felted Kitten Etsy shop to review. Please excuse the creases, we took the pictures the same day it came in the mail so it didn't have time to straighten out yet. Wish I captured her face when she saw the princess crown, it was priceless! But this above comes pretty close to her 'excited' expression. 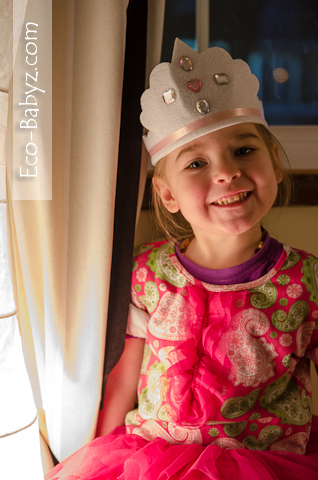 She finally has the crown to complete her princess outfits and it is made of safe materials. I also like that it is soft and she can't hurt her brother with it when they play. We love the adjustable tie that can work on any size head. Although she needs my help putting it on, so if there is one thing I would change is to maybe offer an option of elasticized back - that way she would be able to dress up without my help. It looks really beautiful though the way the ribbon in the front just ties around the head, simple and gorgeous! There are a variety of crowns for both boys and girls at the Felted Kitten and they are all very reasonable priced. The one we reviewed was $8.95, the price range is $6.50 to $9.95, and $22.50 for the more elaborate Cinderella inspired crown. They are also available in sets for party favors! Katrina has generously offered to give away a crown of the winner's choice (excludes Cinderella inspired crown) to of one of our readers during the Handmade from the Heart Event that ends 2/28/2013! 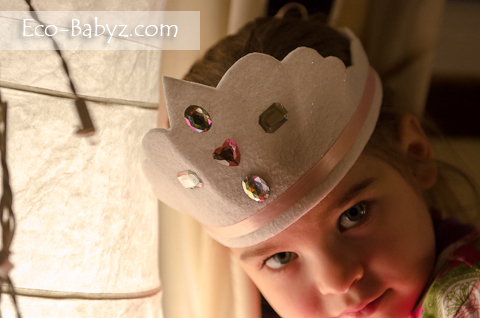 These are adorable--great idea for princess party favors! 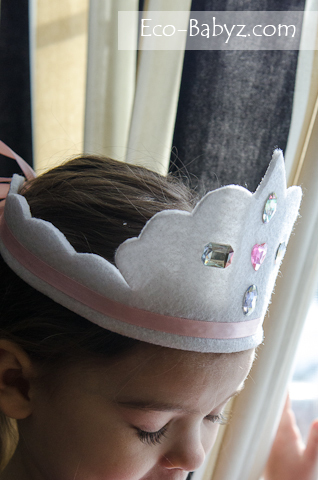 My 7 year old loves anything and everything princess so crowns are an essential item in this house. I hate those cheap plastic ones that break in 3 seconds so these are fabulous!